Time: Opens 11am on Saturday 4th November, then Mon-Sat 10am-5pm to follow. ‘The Winter Exhibition’ opens from 11am on Saturday 4th November, and will run through to 3pm on 31st December. All are welcome to attend the preview opening on the 4th, and enjoy a glass of fizz and handmade chocolates from The Cocoabean Company. The Whitehouse Gallery welcomes in the Winter season with a bumper extravaganza of an exhibition, featuring more fine artists and makers than ever before. Spread over two floors instead of just focusing on the downstairs space, this exhibition promises brand new work around every corner. There will be seventeen fine artists on the walls, and an exciting range of new jewellery, glass, textiles, sculpture, ceramics and more. After some time away, we are excited to welcome back the very popular award-winning illustrator & author Catherine Rayner, with charming silkscreen prints of creatures of all shapes and sizes. Animals are also the chosen subject matter for new artist to the gallery Lucy Newton, who works with a range of media to try and capture just a fraction of the beauty of her subjects, to express the creature’s qualities and the energy of the amazing natural world around us. Local artist Jane Blair will also be exhibiting some of her popular paintings, which will include animals as well as landscapes. Deborah Phillips loves to paint the Scottish countryside in her own unique style, working with acrylics and then applying other materials to create almost three dimensional paintings with a glittering glow. Layering of mixed media to create texture is also very important to Sandra Moffat & Louise O’Hara. Sandra creates powerful landscapes which are incredibly atmospheric whilst Louise uses textiles to add new layers of interest to her work. Colour is important to Sarah Anderson, who also derives her inspiration from the magnificent Scottish landscape, particularly the West Coast, and is concerned with drawing the viewer into the atmosphere of the scene in her paintings. 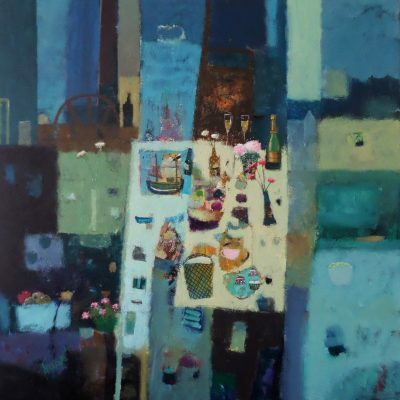 James Somerville Lindsay will return with some of his landscapes, which are inspired by the two places James spends his time equally, Scotland and France. They serve as a comforting reminder of warmer days, at a point when we may crave it the most. No winter exhibition would be complete without some of Silvana McLean’s paintings and prints on the wall. The far north fires Silvana’s imagination, the focus spanning Iceland to the Northern Isles of Scotland. Whether works are sea-based or on geological and glacial themes, the north remains a connecting factor. Fraser Irvine is another local artist who specialises in atmospheric sea and landscapes, with a focus on Dumfries & Galloway. This will be the first time Fraser has exhibited in the gallery, and we look forward to welcoming him. Sheila Fowler is another artist who will be exhibiting some work for the first time, from her recent trip to the Isle of Harris. These will be accompanied by some fresh and vibrant still life work, along with another new artist Sarah Drummond, who will also be exhibiting still life, as well as Spanish scenes from her time spent living there. We are really looking forward to welcoming back James Fraser RSW, who is giving us a good collection of his still life, often portraying objects, figures and nature, sometimes recognisable, sometimes suggestive, and occasionally including some humour. Figurative works will be exhibited by Sophie McKay Knight and Jackie Henderson. Sophie is inspired by the things that make up a whole person, and attempts to incorporate many elements into her paintings to reflect this. Jackie, on the other hand, tends to work in a more autobiographical way, with the birds she often features in her paintings representing herself. Both are concerned with building their paintings up in layers, so what lies beneath is as important as what is visible on the surface. Fiona Millar and textile artist Moy Mackay, both Selkirk based, will also be exhibiting some new work for the Winter. To accompany the work on the walls, we are being spoiled with new collections of glass by Bobbie Coleman and Niki Crew; Jewellery by Heather Andrews, Shark Alley, Amanda Johnson and Melissa James; Textiles by Jo Gallant, Rachel Morley & Dorothy Stewart; Felted Sculpture by Karen Norton; Mixed media Sculpture by Morag Lloyds, Michael Lythgoe, Lynn Muir & Gemma Rees; Ceramics by Mollie Brotherton & Rene Viner. There will also be ongoing collections of furniture, baskets, ceramics, jewellery, sculpture, glass, paintings and much more. Normal opening times are Mon-Sat, 10am-5pm, but please stay in touch for Sunday openings in the lead up to Christmas and New Year.